Electric and magnetic fields (EMF) have different properties and different ways of causing harmful biological effects. Some people become ill from many types of EMF sources, such as alarm clocks too close to their bed, sitting too close to a TV or computer, or using a cell phone. Reported symptoms are headaches, arm and leg tingling, dizziness, difficulty in concentrating, and even nausea. Although not proven, more serious problems might be caused by prolonged exposure to EMF. Most scientists agree that it is wise to protect ourselves from biological effects that are known to exist. Osun’s Radiation Finder is the first one on the market that uses Safe/Caution/Warning labels with light-emitting diodes (LEDs) to indicate the radiation strength of high frequecny as well as low frequency electrical and electronic appliances. It is easy to use, and does not require a technical background. The Radiation Finder can be used to detect both low and high frequency EMF produced by appliances such as cell phones, microwave ovens, power lines, TVs, computers, electrical fans, AC alarm clocks, hair dryers, vacuum cleaners, and washers and dryers. The list is extensive. 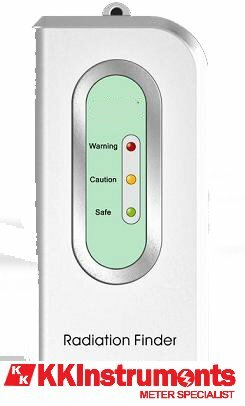 Green light (for high frequency, Less than 0.02 mW/cm2; for low frequency, Less than 2.5 mG): No radiation detected or it is at safe level. Yellow light (for high frequency, 0.02 to 0.1 mW/cm2; for low frequency, 2.5 to 8 mG): Radiation is strong. Be cautious in this area. Red light (for high frequency, higher than 0.1 mW/cm2; for low frequency, higher than 8 mG): Radiation is very strong. 1. Slide the button at the right side up to turn the device on. Three LEDs will be on for a few seconds, after which only the green LED stays on. If no lights are on, check the battery. 2. Walk near any electrical appliance or equipment in your house or office. Mark the area and distance from the appliance when the red LED is on. Read below for suggested corrective measures. 3. Turn the switch off after use. This will prolong the battery life. There are a number of ways to reduce harmful exposure to EMF. Some are as easy as standing back from an appliance when it is in use. Remember that magnetic fields from appliances drop off dramatically in strength with increased distance from the source. If the measured radiation level of a cell phone is high, consider using shielded accessories. If the problem persists, you may want to switch to another cell phone or service company. Cell phone radiation levels vary from phone to phone and from company to company. Other EMF reduction steps, such as correcting a household wiring problem, are worth doing for safety reasons. The traditional way of grounding electrical devices is to connect them to water pipes. However, today's pipes are mostly plastic and do not provide good grounding. One suggestion is to find a pure metal pipe and redo the wiring. It is wise to reduce as much as possible the time spent near known sources of strong EMF. Turn off all electrical appliances when you aren't using them. Frequency range: 50 Hz to 3 GHz. Power: 9V battery (not included). Size: 2.25"x5.25"x1". Weight: 4 oz. Made in USA.